With a name like Premium, you can expect high quality components and reliability from this duplicator. With a wide range of sizes available, your Stordigital Premium duplicator can be purchased with anywhere between 1 and 15 writers fitted. These standalone copiers have a easy-to-use control panel and are packed with many advanced features such as Auto-Copy, Hard-Drive Partition Naming and Password Protection (unavailable on inferior machines). 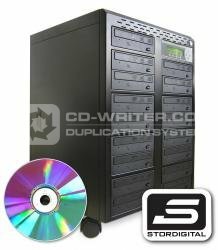 The Premium range of CD/DVD duplicators are assembled in our Greenwich workshop with the finest components available. Our friendly dedicated technical team are always on hand to make sure you get the most out of your purchase.